Juan Antón Garcia isn’t a common name in football circles. When discussing attractive styles of play we come across names like Pep Guardiola, Jurgen Klopp, Jorge Sampaoli etc. Furthermore, when we delve into the abyss of intellectual football talk, we hear names like Juanma Lillo, Paco Seirul•lo, Jorge Castelo just to name a few. However, Juan Antón is certainly one that will almost never come up. Juan Antón Garcia is a professional handball coach who has written over 16 books on teaching and training collective sports, more specifically handball. You might be wondering why a handball coach would ever come into a football discussion. The fact of the matter is many of the tactics and strategies of team sports are transferable, and luckily for us Antón has dipped his toes in the football waters. Not to mention, many Spanish football coaches have been highly successful transferring his work to football, one of which is Oscar Cano Moreno, who frequently cites him in his writing. When preparing this installment of the Positional Play series, I was reminded of Antón’s work which I read a year back, (Balonmano: Fundamentos y etapas de aprendizaje). In this brilliant dissection of team sports, he discusses the importance of the relationship between players. 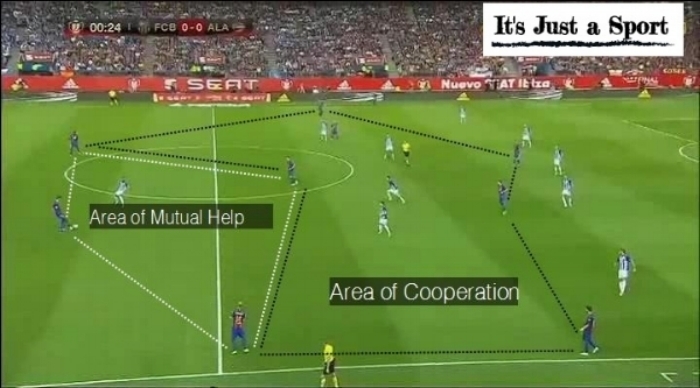 He states, “Collective tactics represents a guide of interactions between teammates which can be seen in the tendencies of tactical means.” In other words, the interactions that occur during a match are the consequence of the structure or spatial distributions which have been set in place. As we’ve discussed in the Part 2 of the Positional Play series, the structure is the foundation of a team’s system, and the interactions are the “games within the game” as Paco Seirul•lo so beautifully states. These ‘games’ or interactions are what we must improve as coaches through the use of a holistic, all-encompassing approach which takes into account the complete structural make-up of the athlete, through different personal aspects like conditional, coordinative, cognitive, socio-emotional, volitional, creative, mental, and bio-energetic, as defined by Paco Seirul•lo. Antón, as well as other sports intellectuals have defined the spaces in which these interactions take place. All definitions are relatively the same. Where they might differ is the naming and division of spaces, nonetheless, they all achieve their purpose in correctly identifying specific areas where players will cooperate. My personal favorite classification of spaces is Paco Seirul•lo’s. He classifies them into two spaces and within each of those areas there are sub-spaces. Simply stated, this space encapsulates the totality of the team’s organized structure. As we’ve discussed this space should be designed by the coach to fit the needs and requirements of the team’s abilities. As the following image shows, this area is the entirety of the formation. This space is characterized as a smaller area of play. If the space of phase is the entire structure of all 11 players of a team, then the space of intervention is the smaller area of play around the ball where three or four players might have to intervene by providing support or in a more forthright manner by being in control of the ball. Using the previous image, we can see the space of intervention as a small radius around the ball where the players have a straight forward collaboration with the ball possessor. With the spaces defined, we now must identify the players involved in said spaces. Just like in the team’s structure, specific positions are not bound to certain roles or relationships. At any given moment, any player will become the ball possessor or carrier, direct supporting player, or indirect supporting player. The aforementioned roles each have distinct responsibilities which they must complete in order to improve the team’s interactions. As the name implies, this is the player who is in possession of the ball at any given time. This can be anyone on the field from the goalkeeper to the striker. The first responsibility of the ball possessor is to dribble to attract opposing players. Logically, this can be done anywhere on the pitch. However, the amount of risk increases the further back on the pitch you are. That is to say, if the goalkeeper has the ball at his feet, most likely he will not try to dribble the ball out; rather he will find a supporting player with a pass. Dribbling up the pitch serves two purposes. Firstly, as I’ve mentioned, the opposition will step to the ball possessors therefore opening up a teammate somewhere on the field. If the team has a good structure, and is evenly distributed, then the teammate that is open will be within a passing lane of the ball carrier. Secondly, if the opposing team doesn’t step to the ball possessor, then the team will be able to progress up the field with the ball under control. Some people may argue that passing the ball is the quickest method to move it, although they fail to recognize that dribbling is the safest method (that is, when the ball possessor is not under pressure). So when given space to dribble, the ball carrier should take as much space as possible. This brings up the ball possessor’s responsibility number two; pass the ball when an opposing player steps to win the ball. Once the dribbler has attracted movement from the opposition in the form of pressure, it’s his duty to find the open space which the opposing player has left. Hopefully, all players will be correctly positioned and finding the free man will be simple. In the case that the ball carrier cannot easily find the open man, than he should keep the ball in order to maintain possession. This is his third responsibility. This obligation requires a high level of ball control in order to safeguard the football. As we’ve learned, there are two spaces where players will intervene; space of cooperation/phase and space of mutual help/intervention. Direct supporting players will strictly exist in the space of mutual help. 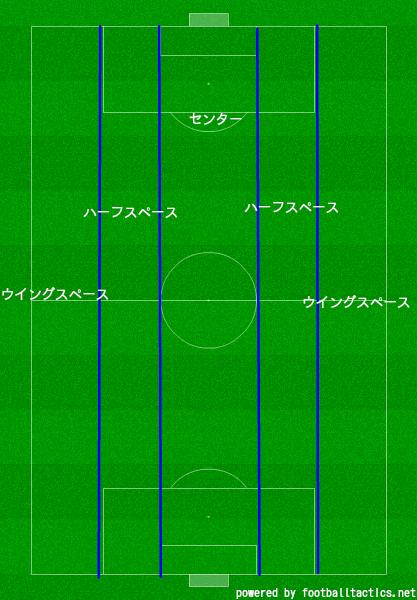 These are the three of four players which surround the player with the ball. When offering support they have several responsibilities. Firstly, when they offer support they should position themselves between opposing players. This can mean between lines or between positions. Simply stated, if an opposing player were to mark them directly, they should move to find a space between defending players. Secondly, they have to position their body to face the play of the game. In doing so, they will provide the team with continuity of play if the ball is to reach them. To give continuity is to be able to pass the ball to the next location without having to rearrange your body shape. This allows for quicker ball circulation and ultimately, faster movement up the field. Lastly, the direct supporting player should try to create situations of 2v1 with the ball possessor. Like we know, when the player with the ball is pressured, they must have direct support to immediately make a pass. In these situations is where we’ll find 2v1 opportunities, and this comes down the direct supporting player recognizing that his mark has left him to pressure the ball therefore leaving him open to receive the ball. In essence, this is the 2v1 the team is looking to create via positional play. First, they must hold the opponent to their positions in order not to collapse the structure of the team. This can be done by simply not moving, by staying put. In the case of winger on the opposite side of the field, if this player stays wide, this action forces his mark to keep an eye on him and to stay in that general space, therefore, indirectly creating more space elsewhere. This may sound simple but when we give this player their second and third responsibly, it becomes a skill they have to master. This brings us to the second task of an indirect supporting player; providing adjustments and balance. Apart from keeping their nearest defender engaged and held to their position, they must also, read the game in the space of interaction to provide positional balance the team may need. This could mean moving ten yards in any direction because a certain player has had to leave his position to provide direct support. The team’s structure set by the manager will indicate where the balance or adjustment should be given. Basically, the indirect supporting players must analyze the structure and position themselves to maintain said structure. Lastly, the indirect supporting players should provide a long pass option if necessary. Being in a good position to receive a long ball not only relieves the team of pressure they might be under but also provides an opportunity to take advantage of the opposing team’s imbalance. Positional Play's Player Roles from It's Just a Sport on Vimeo. The nature of these interactions are in group, whether that’s a small number of players or the entire team. Hence, the whole team should be on the same page when applying the aforementioned tactics. The following points and concepts are checkmarks that allow the manager to steer the team in the right direction. Bearing them in mind facilitates the organizational and evaluation processes that go along with designing sessions. When evaluating the play of the team, this should be the first metric to judge whether the team is on the right track towards implementing a successful positional play system. The spatial distribution is how well the team is able to maintain its shape and structure. As we know, indirect supporting players are fundamental in achieving this. Juan Antón explains, “Ball circulation is a fundamental tactical means in the development of positional play.” Moving the ball through the team’s structure creates openings and spaces for the team to attack the opposing goal. However, the team must never pass the ball simply to pass. The right conditions (2v1’s, correct body positioning, receiving in between lines or positions, etc) should be in place before the pass is executed. As a coach, it’s important to continuously watch the team’s play in training or matches, and when doing so this is something which should be taken into account. If players are instinctively able to examine their surroundings, and consequently alter their positioning to give the team the correct spatial distribution, then this is a sign of cognitive development. Players should consider their teammates, along with opposing defenders. When they are too close to their nearest teammate or the defender is marking them very closely, they should instinctively move a few meters in the correct direction. Just as a well defined structure is the basis of developing healthy interactions between players, interactions provide the team with opportunities to create superiorities. These numerical, positional, or qualitative advantages will be the topic of part 4 of the Positional Play Series. 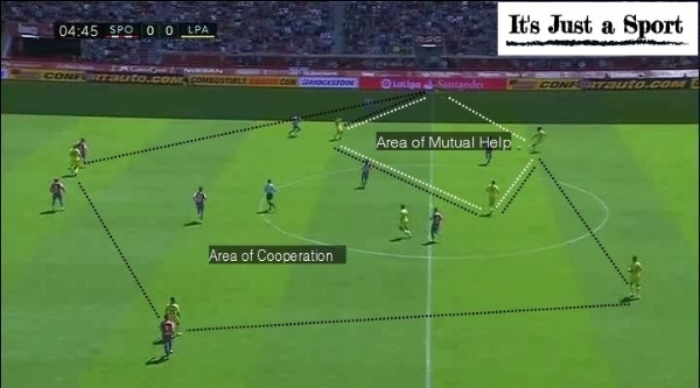 Check back soon for the continuation of the Positional Play Series on superiorities, and, like always, if you have any questions about any of the material discussed in this article I’m always up for a discussion on Twitter (@IJASport), via email ijasport@gmail.com, or on Facebook (It's Just a Sport).